Whether it’s in the preseason, regular season, or WHL Playoffs, the Spokane Chiefs and Portland Winterhawks have yet to disappoint fans when it comes to entertainment value. 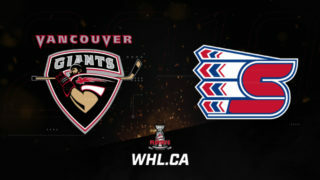 After three playoff meetings in four seasons near the start of the decade, fans of the two teams had to wait until last season for the next dose of the rivalry in the WHL Playoffs. Now they’re getting it in back-to-back seasons. As the two teams put on an offensive showcase during the season series, the Chiefs earned a marginal edge with a 3-2-0-1 record to a 3-3-0-0 record by the Winterhawks. This matchup has all the makings of a long, high-scoring series. It may not be in either team’s interest to have one of those in the first round, but 55 goals in six games — 56 if you count the extra goal earned in the shootout — suggests that’s where we’re headed. Portland’s dynamic duo of Joachim Blichfeld (San Jose Sharks) and captain Cody Glass (Vegas Golden Knights) are always deserving of more attention while Brendan De Jong (Carolina Hurricanes) patrols the blue line and Joel Hofer (St. Louis Blues) tends to the crease duties. Forward Reece Newkirk and defenceman John Ludvig are on NHL Central Scouting’s radar for the 2019 NHL Draft as well. Second Place – U.S. Division Standing Third Place – U.S.
Start the game strong: When comparing scoring by period, the Chiefs had a plus-25 goal differential in the first period. That didn’t translate well over to the season series against the Winterhawks’ as Portland actually outscored the Chiefs 9-8 in the first period of their six combined games. Otherwise, the Chiefs have been strong in the opening 20 minutes, scoring 89 of their 267 goals. History is on your side: Since the Chiefs won a first-round meeting in 2003, it’s been all Winterhawks in the following four meetings. 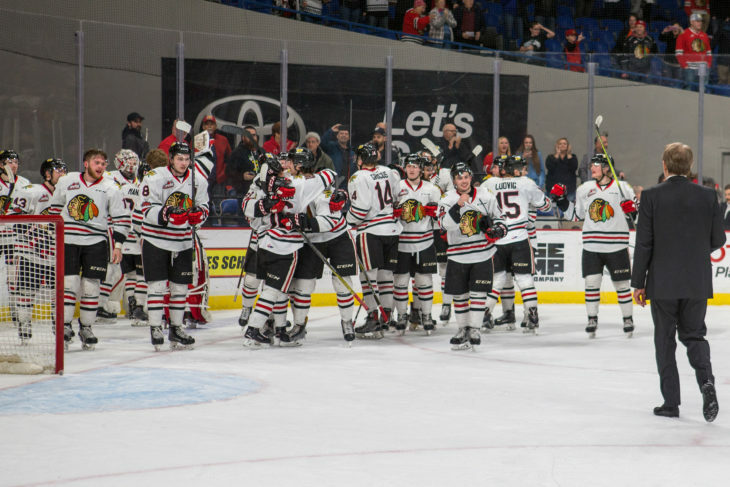 Last year’s series went the distance, but the Winterhawks still have several players who experienced the success of last year’s series and are ready to replicate that again. Without the off-season departures of Skyler McKenzie and Kieffer Bellows, players like Jake Gricius and Reece Newkirk have stepped into those offensive roles and succeeded. Following a blueprint of the 2018 matchup or previous series victories won’t necessarily lead to success in this year’s matchup, but you can bet the experienced Winterhawks in the lineup will be ready to lead the charge against an opponent they feel is more than beatable, even if they don’t hold home-ice advantage. Riley Woods (29-46–75): Since an early 2017 trade brought Woods to the Chiefs from the Regina Pats, he’s been an offensive catalyst for Spokane with 60 of his 75 career goals in 171 games. He began his 20-year-old season with eight goals in his first nine games and six multi-point efforts in his first 10 contests. Woods is good enough that the Winterhawks will know to give him extra attention, but as a player without the last name Smith or Anderson-Dolan, he could find himself the beneficiary of open ice and less attention. With Woods’ offensive ability, that would easily mean trouble for the Winterhawks’ defence. Joachim Blichfeld (53-61–114): In terms of offensive threats, there’s nothing quite like having the regular season leading scorer in the WHL staring you down, looking for the tiniest of gaps to expose. San Jose Sharks prospect Joachim Blichfeld terrorized defences in the WHL this season. In winning the WHL scoring title, Blichfeld became just the sixth Winterhawk, including Brendan Leipsic and Nicolas Petan who tied for the award in 2012-13, to win the Bob Clarke Trophy as the WHL’s Top Scorer. The last Portland player to accomplish the feat was none over than fellow Denmark product Oliver Bjorkstrand in the 2014-15 campaign. While he didn’t lead all players in scoring during the season series, Blichfeld did lead the Winterhawks with 12 points (5G-7A) and did finish first in goals. While it hasn’t been easy, the Chiefs will need to find a way to contain Mr. Blichfeld if they are to stand a chance in the series. Ty Smith (7-62–69): Since the Spokane Chiefs selected Ty Smith first overall at the 2015 WHL Bantam Draft, the defenceman has done incredible things for the U.S. Division club. A constant at the top of the WHL defensive scoring charts the past two seasons, Smith set a new career-high for assists, eclipsing the 60-assist mark this season. What’s even more impressive about his 69 points this season is that despite playing in 12 fewer games than last year, he was just four points off his career-best mark. When he hasn’t been showing off his superb passing skills that convinced the New Jersey Devils to take him in the first round of the 2018 NHL Draft, the Lloydminster, Alta. product has shown off his shooting skills with seven goals. As the lone defenceman in the WHL to finish in the top five of defensive scoring each of the past two seasons, we’d be stating the obvious in describing his importance to the Chiefs on the blue line. In last year’s first-round series, Smith had seven points and was one of the Chiefs’ top three scorers. Jared Freadrich (15-33–48): Throughout the course of 263 WHL regular season games, Jared Freadrich has been a steady point producer and the same was true as he joined the Portland Winterhawks ahead of his 20-year-old season. 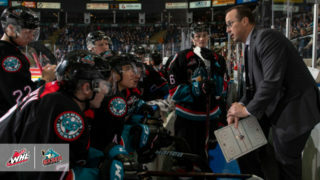 For a fourth consecutive season, Freadrich’s offensive development saw him post career-best totals, beginning with the Regina Pats, Red Deer Rebels, Victoria Royals and now in Portland. 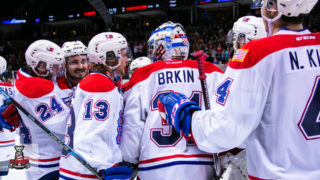 Bailey Brkin (45 GP, 27-11-1-2, 2.75 GAA, .914 SV%, 2 SO): When the goals per game average for the two teams combined is nearly in double digits, you simply need your goaltender to be the best of the two on the ice in order to have a shot at winning. That’s what Bailey Brkin did for the Chiefs during the season series. Though he and the Chiefs endured some tough results as part on an evenly-match season series, Brkin looked sharp in other outings. He posted a 50-save performance in Portland on March 1 and stopped 36 of 37 shots in the opening game of the season series back in October. The flip side of that was giving up seven goals on home ice and five goals in Portland during other matchups throughout the season. If Brkin can bring his best, it’ll be a tough go for the Winterhawks in the series. 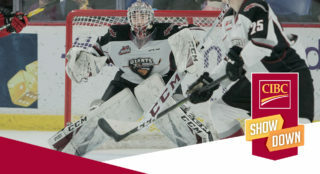 Shane Farkas (50 GP, 30-12-3-3, 2.71 GAA, .906 SV%, 4 SO): Heading into the 2019 WHL Playoffs, 19-year-old Shane Farkas appears to have control of the crease to start. That’s no slight to mid-season acquisition, but after appearing in 50 games, Farkas showed well in handling the starting duties and should get his chance to prove his worth to begin the playoffs. Along with Dante Giannuzzi, all three Winterhawk goaltenders won a single game during the season series. Like Brkin, Farkas definitely has room to grow as a 1999-born puck stopper in the WHL, but he’s also capable of frustrating opposing offences. Having said that, Joel Hofer (St. Louis Blues) has preformed aptly as well. If the Winterhawks had their hand forced to make a change, they could do so with confidence in the Winnipeg, Man. product. 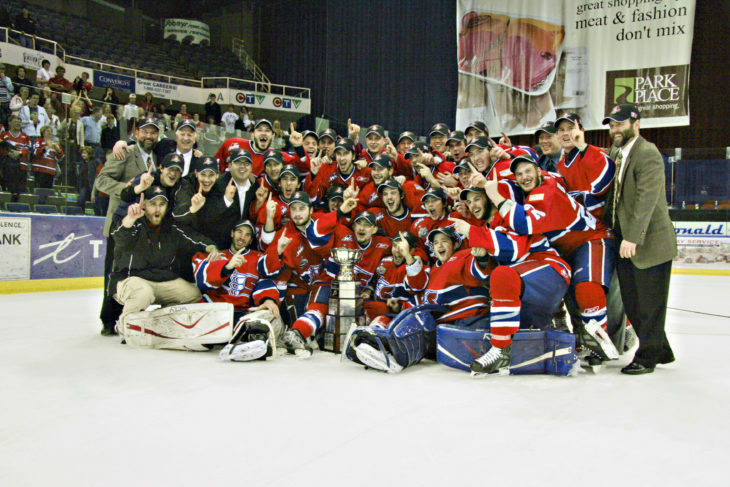 The Spokane Chiefs have tasted success before, winning the WHL Championship and Memorial Cup in 1991 and 2008. They’ve also qualified for the WHL Playoffs in 12 of the last 13 seasons, which speaks to their ability to build long-term success. The Chiefs are battling a tough mindset though, having lost in the first round in their four previous playoff outings. Before that, they lost in the second round in consecutive appearances. However, the tough part of the WHL Playoffs is that previous performances can loom over a team like a dark cloud. Last year’s first-round exit against the Winterhawks came down to a seventh and final game, which may sting the most out of the four-straight series losses to Portland. In a competitive U.S. Division where playoff success means everything, the Chiefs would sorely like to deliver the Winterhawks and their other three divisional opponents some revenge for past exits. The 2007-08 Spokane Chiefs won the WHL Championship and Memorial Cup with WHL Alumni like Dustin Tokarski, Tyler Johnson, and Jared Cowan. Photo: WHL Archives. 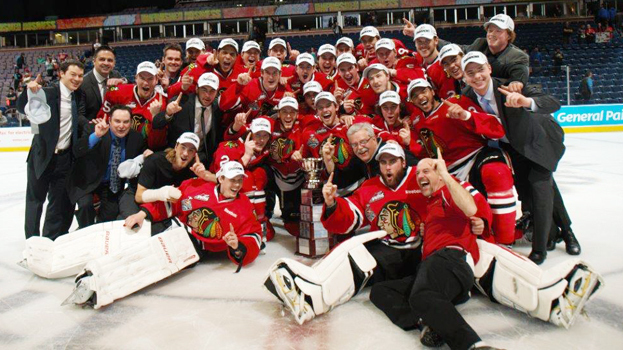 Marking 10 consecutive seasons in the WHL Playoffs, the Portland Winterhawks have enjoyed plenty of success over that time. 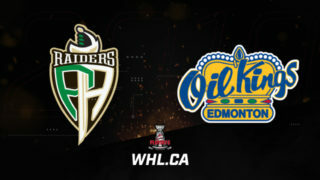 Four trips to the WHL Championship, five appearances in the Western Conference Championship and advancing past the first round in eight of the nine previous seasons. The downside to this is that they haven’t been past the second round since 2015. For the five-time WHL Champions, twice as the Edmonton Oil Kings, it feels like time is continuing to tick down on Joachim Blichfeld and captain Cody Glass still being members of their team as the professional hockey ranks will come calling soon. 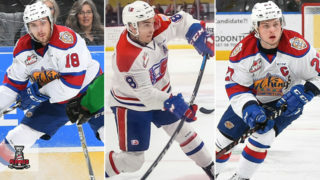 With two dynamic stars in their forward core as well, a competitive bench boss in Mike Johnston, and their aforementioned playoff success, the Winterhawks have the resumé to prove they belong among the WHL’s best. How will they show that this year?